Bad news, fellow meat bags. Check out the latest video of Boston Dynamics' freakishly talented Atlas robot, and you'd be forgiven for thinking the final days of the Age of Man are at hand. I, for one, am bitter. 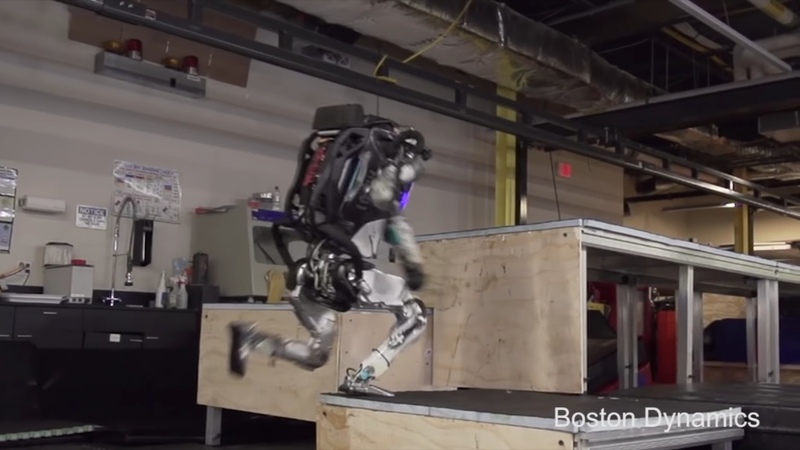 Boston Dynamics points out that Atlas is using its whole body, this including the arms and torso, to perform the jumps. "Atlas uses computer vision to locate itself with respect to visible markers on the approach to hit the terrain accurately". The robots probably murdered them all. Late past year, Boston Dynamics revealed the Atlas robot could do what seemingly appeared to be gymnastics-approved backflips. Boston Dynamics recently released a video which showed the humanoid robot running and crossing the obstacle course, leaping over a thick log and then jumping on three separate wooden platforms. "Atlas' ability to balance while performing tasks allows it to work in a large volume while occupying only a small footprint". Amid this week's depressing news about looming, climate-change-induced disaster, perhaps we can take solace in the possibility of fast-moving, unstoppable robots getting us first. Boston Dynamics is also working on at least eight other robots, including Handle (which can use both legs and wheels), Spot (a four-legged dog-like robot which can traverse hard terrain), and Sand Flea (a small RC car-style robot which can jump onto the roofs of buildings).